WikiLeaks today began publishing more than five million confidential e-mails from US-based Intelligence firm Stratfor. About 5.5m emails obtained from the servers of Stratfor, a US-based intelligence gathering firm with about 300,000 subscribers and has been likened to a shadow CIA. The emails, snatched by hackers, could unmask sensitive sources and throw light on the murky world of intelligence-gathering by the company known as Stratfor, which counts Fortune 500 companies among its subscribers. Stratfor in a statement shortly after midnight said the release of its stolen emails was an attempt to silence and intimidate it. The Online organisation claims to have proof of the firm's confidential links to large corporations, such as Bhopal's Dow Chemical Co and Lockheed Martin and government agencies, including the US Department of Homeland Security, the US Marines and the US Defense Intelligence Agency. 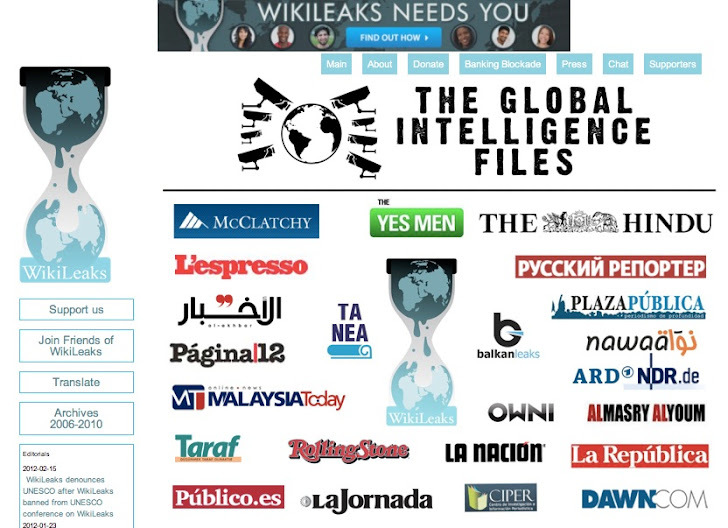 WikiLeaks did not say how it had acquired access to the vast haul of internal and external correspondence of the Austin, Texas company, formally known as Strategic Forecasting Inc.
Stratfor, somewhat akin to a privatized CIA, sells its analyses of global politics to major corporations and government agencies.Members of Anonymous with direct knowledge of the hack and transfer of data to WikiLeaks told that the group decided to turn the information over to WikiLeaks because the site was more capable of analyzing and spreading the leaked information than Anonymous would be. People linked to Anonymous took credit for the data theft. 'Congrats on the amazing partnership between £Anonymous and £WikiLeaks to make all 5 million mails public,' AnonSec Tweeted. Hackers linked to the loosely organized Anonymous hackers group said at the beginning of the year they had stolen the email correspondence of some 100 of the firm's employees. WikiLeaks and Anonymous maintain the emails will expose dark secrets about the company. The first batch of released emails contains only 167, and the rest some 5 million are to be gradually released in the coming weeks, as WikiLeaks media partners report on what they found in them.The source of the leaked emails is Anonymous, who got their hands on it when they breached Stratfor's systems in December. Bradley Manning, the man suspected of turning over a massive cache of classified US documents to the secret-spilling site, on Thursday declined to enter a plea at his arraignment. Manning, a 24-year-old US army private, is charged with 22 counts in connection with one of the biggest Intelligence breaches in US history. WikiLeaks was due to hold a Press conference at London's Frontline Club later today. After Stratfor's computers were hacked at least twice last December, the credit card details of more than 30,000 subscribers to Stratfor publications were posted on the Internet. The hacking attack on Stratfor is subject to an FBI investigation. Several alleged members of Anonymous have been arrested by authorities in the US and UK as part of investigations.Stratfor had not at the time of writing commented on the authenticity of the published material.